Yesterday, a delegation of statehood supporters - led by Puerto Rico's Resident Commissioner and Congressional Representative, Jenniffer Gonzalez - submitted legislation proposing the acceptance of Puerto Rico as the 51st state of the United States. As our organization tends to focus on the promotion of investment opportunities and policies that benefit the long-run economic development of Puerto Rico, we thought it prudent to discuss the economics behind the push for Puerto Rico as the 51st state.
" . . . While most believe that statehood will benefit Puerto Rico’s development, few realize the economic contributions it will return to the country as its newest member. Under its current status as a territory with limited autonomy, high levels of economic and political risk continue to constrain investment and the island’s ability to contribute to its own well-being. 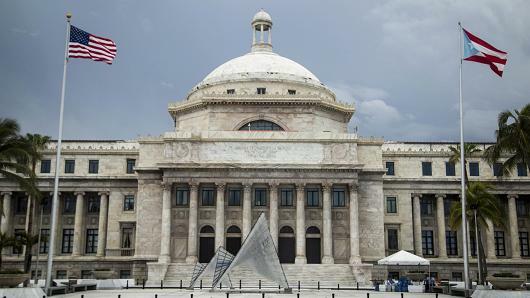 The recently formed fiscal oversight board (created by Congress’ PROMESA Act of 2016), in combination with the policies of one of the nation’s most fiscally conservative governors, is expected to lay the groundwork for fewer economic risks. However, Puerto Rico’s uncertain political future still creates uneasiness in the eyes of investors. Neither the status quo – which led to its recent fiscal crisis – nor independence (will it be more like Singapore or the next Cuba?) will evoke confidence that investors demand. If Puerto Rico is allowed to become a state, political certainty will lead to an investment boom with implications for the entire U.S. economy. With a growing economy, fewer transfer payments will flow from the Federal Government to Puerto Rico, while individual and corporate contributors will be less likely to leave the island for greener pastures on the mainland. As investors gain new confidence in Puerto Rico’s future, the stifled economy will be able to remove a burden that has been building for decades, allowing the island to reach its full economic potential. Even under the recent conditions of high debt combined with a shrinking economy, estimates suggest that corporate and individual taxpayers in the new state will contribute $6-10 billion more to the U.S. Treasury’s bottom line. Further considering the market dynamism of an improved economic climate, and it is easy to see how many more billions of dollars of profits, individual income, and taxpayer revenue can be produced. Combine increases in corporate and individual entrepreneur investment with Puerto Rico’s positive trade balance, the expectation of rapid growth in an already productive tourism sector (imagine a state as beautiful as Hawaii, but takes only one-fifth the time to get there from the East Coast), and an opportunity for improved intrastate commerce (sorry Miami, Puerto Rico is poised to take over as the gateway to the Americas), and the new state’s economic productivity will be a welcome addition to the U.S. economy. . . ."
Read the entire article here, or a more general discussion in The Hill here. It's easy to discount Foreign Direct Investment (FDI) as but a small and insignificant portion of our total U.S. economy. After all, it generally contributes but 2.6 percent or so to total GDP in the U.S. However, despite the small percentage, the contribution to the creation of jobs and growth is substantial, and can and should be in Puerto Rico as well. Consider that, as of 2015, FDI accounted for nearly 7 million jobs across the country, or nearly 5 percent of all jobs. And these are just the direct jobs accounted for; indirect jobs that ripple throughout a dynamic economy will increase that number substantially. In Puerto Rico, FDI contributes to nearly 25,000 direct jobs . . . or at least it did before last year's hurricane season. To put it in context, if all of these jobs suddenly left Puerto Rico, the unemployment rate would skyrocket from the palatable 9.6 percent (as of May) to nearly 12 percent - almost a 25 percent increase - overnight. Today, the Department of Commerce (through its subsidiary SelectUSA) released a report highlighting the value that FDI in rural areas provides to the country as a whole. While total investment in new projects in rural areas makes up a small percentage of aggregate investment, the economic impact is disproportionately large, adding tens of billions to economic output over the last decade, with an average project size in rural areas that equals nearly double that in metro areas (in terms of dollars invested) with 25 percent more jobs. Given rural FDI's disparate impact on economic growth, an opportunity becomes apparent. FDI in the rural areas of Puerto Rico could likely create more impressive economic outcomes than that in the metro area. In policy terms, perhaps this allows for an opportunity to ensure that foreign investors are made aware of rural investment opportunities and are incentivized (i.e. tax and other financial incentives) to consider the benefits therein. After all, the return to Puerto Rico for such an investment may be higher than in other areas. Puerto Rico's legislature recently delayed the consideration of the Governor of Puerto Rico's proposal to revamp the tax code. For Puerto Rico to continue on its path to eventual economic growth, the legislature should consider, and pass, the remodeled code as soon as possible. The first proposal is intended to reconsider the tax incentives applied over the last decade or so, which were first intended to promote growth through external investment. While some incentives have fared well, others have been money pits that benefit only the recipients. It makes sense to improve efficiency by weeding out the latter and doubling down on those that create jobs and contribute to growth. Latin American countries throughout the 80s and 90s, as well as all fledgling economies, have experimented with incentives in the same manner and all have eventually shifted policies to improve their efficacy. Puerto Rico must do the same to stay on forefront of innovative and effective policies. In the second proposal, the Governor's administration wants to return "money to the people" by reducing tax rates on individuals and businesses. In the face of fiscal austerity (see proposals by the Fiscal Oversight Board), it seems counter-intuitive for a government to reduce tax rates, but contemporary research gives sufficient evidence to positive fiscal outcomes (especially in regards to tax receipts) in light of rate reductions. Considering the more common Keynesian economic views, more money in the hands of individuals will lead to more money being spent and a boost to the economy. While many counter that such a transmission works differently in reality, the many continuing needs of struggling individuals and businesses (to buy new furniture or rebuild post-Hurricane Maria, for example) it is likely that higher net income will have such a positive impact on the economy, ceteris paribus. In the end, both proposals will likely result in positive contributions to future growth. Justin Vélez-Hagan is the executive director of The National Puerto Rican Chamber of Commerce and the author of The Common Sense behind Basic Economics, as well as the upcoming The Paradox of Fiscal Austerity. The Economic Development Bank of Puerto Rico (EDB), which took over the administration of certain economic statistics for the now defunct Government Development Bank of Puerto Rico, released the most updated data from its Economic Activity Index (EAI) this week. Good news: according to the agency's data, economic activity has increased month-over-month for the entire year to date. While the index is still not on par with the pre-disaster levels of 2017, it has shown an unexpected resilience in the face of numerous obstacles including out-migration, lack of electricity and damaged infrastructure for much of the island over the same time period, and a general sense of investor wariness. Many economists expected a continued economic decline through at least some portion of 2018. Combined with a steady labor force (see yellow arrow below) in recent months and improvements in employment (green arrow) and, subsequently, the unemployment rate (red arrow), and economic indicators point to a generally positive trend over the first third of 2018. The Economics of Puerto Rico . . . This blog will host weekly updates on the economy of Puerto Rico, breaking down the complicated statistics, BLS data, and policy implications surrounding Puerto Rico’s beleaguered economy and provide just the basics so you can make better-informed decision related to investment opportunities and advocacy efforts . . . all from the perspective and understanding of highly-trained economists.